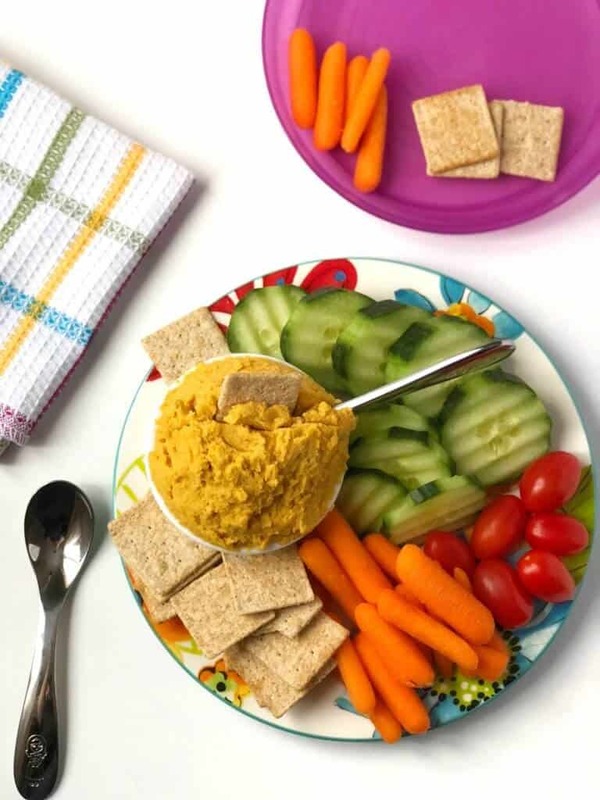 “Mom this carrot dip is kind of good, we made that?” If you are looking for a new smooth and creamy vegetable dip for kids to try, then this Sunshine Carrot Dip should be next on your list! This fun and healthy dip has a mild flavor that is perfect for kids or adults to dip all kinds of crunchy veggies, crackers, or even as a smear on a sandwich. Roasting the carrots makes them extra yummy. This dip is also dairy free, nut free and gluten free, so a great alternative for many different people with different diets. So many kids in my life go crazy for dip. We knew this one kid who his mom could literally serve almost anything with dip and her kid would eat it. I think it was the crunch he liked best, though sometimes he could finish a bowl of dip with only one celery stick if you let him. My kid with dip? She often pokes it… and sniffs it… and it has to be something really special before she will even give it the time of day. But that doesn’t mean I stop serving it because every now and then there is a dip she just gobbles down… like this one! Smooth, creamy, mild this sunshine carrot dip will give veggies or crackers just a little extra omph. It’s almost more of a spread, and I bet it would also be delicious on a wrap. If you are a family that loves hummus, this dip is similar but uses Sunflower butter to give the carrots extra creaminess. This is also a fun veggie dip to put out at a party, and a great alternative to the standard ranch or dill dip. Start out by washing your chickpeas well. 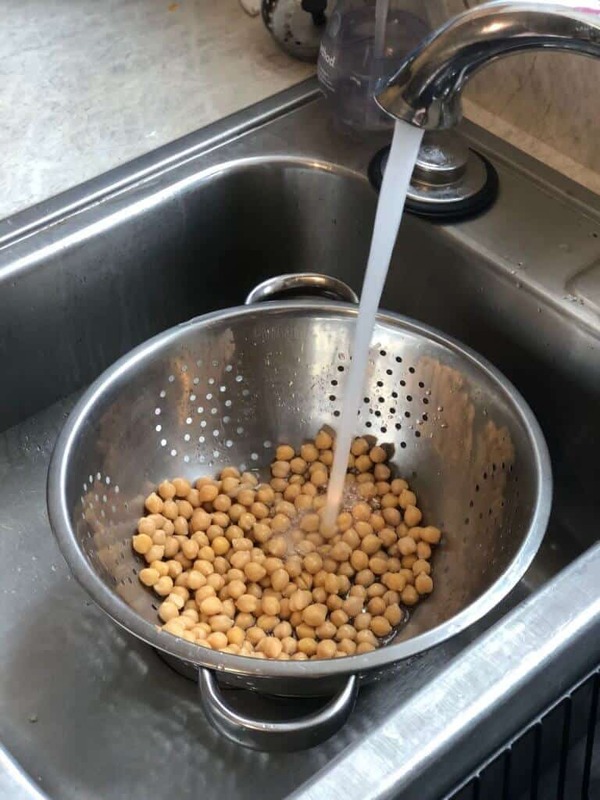 Cooks Illustrated did the test, and it removed between 20-26% of the sodium from canned beans and legumes if you rinse them straight out of the can. So I always rinse whether I buy regular or low sodium chickpeas. Plus this is a great job for kids to help with! Time for a bath! Kids can also help to run the food processor, once the lid is on securely of course. I think all kids like to push buttons, so it’s a perfect job for them. Just make sure to keep little figners away from the blades when the food processor is open. Speaking of lunches, this dip uses Sunbutter as the base which is my favorite school safe alternative to peanut butter. Made from sunflower seeds, it is a great option both for those with food allergies but also for taking to schools. Spread tin foil on a cookie sheet and spread out chopped carrots on the pan. Roast carrots for 13-15 minutes in the oven. or until tender then let cool for 3-5 minutes. 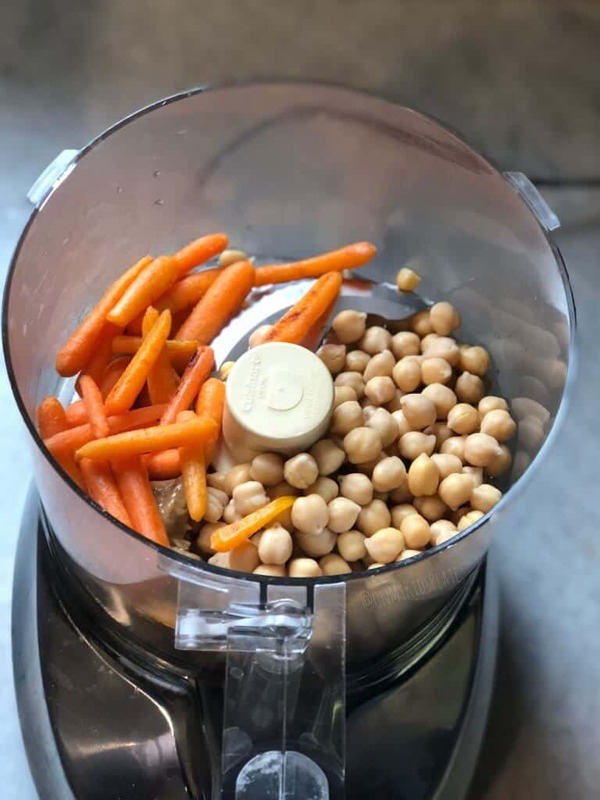 In a food processor, add chickpeas, roasted carrots and Sunbutter. Blend until smooth. Taste the dip. If needed, add a pinch of salt and blend again, then serve with veggies or crackers. The recipe makes one cup of dip which equals 8 servings of dip. Rinsing chickpeas helps to remove salt, which many canned versions are packed in excess. I prefer to add a pinch of salt at the end for flavor and reduce the overall sodium in this recipe. If using full salt chickpeas, I recommend tasting before you add salt at the end. If preparing for small babies and toddlers, I would omit any extra salt. Sunbutter is a sunflower spread used in this recipe and is commonly found with other nut butter spreads in the grocery store. Tahini (sesame paste) can also be substituted in this recipe if you prefer. 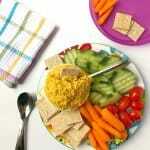 So what do you think, would your kid be game for Sunshine Carrot Dip? What would you dip in this fun spread?